Since last week, I have had occasion to rethink some of what I have noted below. For starters, thanks to a letter penned by my grandmother in 1952 which came to me courtesy of Tony BROWNE, I now know that she at least understood that we had a connection to the Sligo BROWNE family line. How this came about, we don't exactly know. Furthermore, the ring that I wear, which came from her, ties in to the BROWNEs of Janeville - at least motto-wise - and they tie back to the Montague BROWNES from whence came the Sligo BROWNEs. And to complicate things further, the Galway BROWNEs married into both my family tree as it is currently known to me and into the Westport BROWNE family tree. So we may be related to the whole darned lot of them. Just when I thought it might get simpler! Sharon Oddie Brown, August 5, 2004. The three crests above are both interesting and confusing. I have a ring with our family crest inscribed on it that was given to me by my grandmother, Jeannie (Browne) BROWN a few months before she died. Her dear friend Kate WATSON, who later became my godmother, had given it to her years earlier. The inscription on the inside of the band says “Jeannie From Kate. I have worn it ever since I received it. So, how does the crest on this ring compare with the crests above? 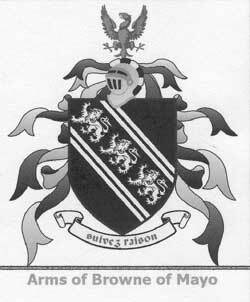 The motto, “suivez raison” from the Arms of Browne of Mayo is close to my ring’s “suivez la raison”. The additon of "la" is an intriguing linguistic hiccup, but likely nothing more can be read into it. The engraving of the eagle on my ring is closer to the eagles in the crests of either Arms of the Browne of the tribes of Galway or the Arms of Mulrankan, Wexford. The only difference is that the eagle on my ring has one head rather than two. Now, I don’t know when Kate gave this ring to my grandmother, but there is a possibility that its ambiguity was intentional. After all, Grandma was a BROWNE before she married a BROWN. Is it possible that the ring intentionally conflates two family origins and that therefore we could profitably search along two of the ancestral lines above? At this point, I haven’t a clue. As it is, both BROWNE and BROWN are extremely common surnames, one of the most numerous in the world. Not that this means we have to throw up our hands in despair when we try to track down our ancestors roots in Ireland. Although the name is not of Gaelic-Irish origin, there are several BROWNE roots that are sufficiently established to be regarded as “native” and known in Irish as DE BRUN. 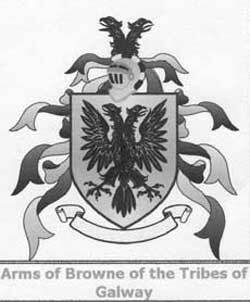 The BROWNES of Galway are one of the “fourteen tribes of Galway” (so are the MARTINS, but I suspect that searching this avenue for our MARTINs of Ardglass will not be fruitful for us, though I could be wrong). This family descends from Sir Hugh le Brun of Wales, who was in turn descended from the Counts of Marche in Normandy. A nephew of his, also named Hugh married Isabel, of Augouleme, widow of King John and their son William de Valence, Baron by Tenure, was created Earl of Pembroke in Wales, by Henry III. The first-mentioned Hugh had a son, Stephen who married Eva, sister of Griffith, Prince of Wales, and had three sons: Hugh, Philip and William. The latter two having distinguished themselves in the Civil Wars against Henry were, to escape his resentment, obliged to join in the invasion of Ireland by Strongbow, in 1170, in which year Philip was appointed Governor of Wexford. 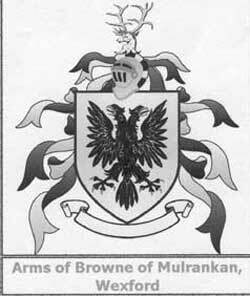 The Brownes of Mulrankan remained in Wexford till their property was confiscated in the Commonwealth period. Philip, of Mulrankan, is said to have been the ancestor of the Matthew Browne of Mulrankan, from whose son, Sir John Browne, are descended Lord Kilmaine and the Marquis of Sligo. David, a great grandson of William (Philip's brother), was companion-in-arms of Rickard de Burgo, the Red Earl of Ulster, with whom he was connected by marriage, and obtained extensive possessions near Athenry, the capital of the Anglo-Norman settlers in Connaught. He died at David's Castle; having with his son Aymer built the Castle of Carrabrowne, in Oranmore, thus establishing what would become the Browne dynasty in Galway. The surnames of the families into which the Brownes married reads like a "who's who" of powerful families in Connaught; Bermingham, Blake, Lynch, Bodkin, French and Burke, being Norman and O'Flaherty, O'Malley and Mullally all being Gaelic Irish. These marriages all served to ensure that the family became firmly established in the area and like so many of their Norman colleagues, "more Irish than the Irish themselves". If you glazed over halfway through that, no worry. I usually do too - and I even have the whole lineage here mapped out for my own reference. I will post that later. If and when we do find the connections, then we have the story going back to the 1100s, some of it reliable, some if it little bits of fancy. Regardless, the BROWNEs of Mayo have further interest for us because of one little clue and it is worth following the next bits that I have gleaned from another source. THE MAYO BROWNEs. The Mayo BROWNEs are from the town of Westport, County Mayo. The town is sited near the mouth of the Carrowbeg River in a corner of Clew Bay at the western extremity of the central plain. In short, it is a good place to be. Archeological sites show people living there at least 5,000 years ago. Not that they were called BROWNE, but we’ll get to that. A site called Cathair na Mart (The Stone Fort of the Beeves) was burned and destroyed by Sir Nicholas Malby, Governor of Connacht in 1583, in his campaign against the Mayo Burkes. During the 17th Century, it passed from the O’Malleys to Lord Mayo and then from the third Viscount Mayo to John BROWNE (married to Maud BOURKE) whose son Peter BROWNE inherited the site. I hope I haven’t lost you. We are getting closer now to the part where there is a clue about a connection to the BROWNEs of our time. "We descended to Westport, a small village situated on a rivlet which falls into that bay, and makes the south-east corner of that great bay, in where there are some small islands... Mr. Browne's house is very pleasently situated in the south side of the rivlet over which he has built two handsome bridges, and has formed cascades which are seen from the front of the House... This is an exceedingly good house, the design and execution of Mr. Castles; Mr. Browne designs to remove the village and make it a park improvement all round; there are fine low hills every way which are planted and grow exceedingly well; the tyde comes just up to the house and the cascades are fine salmon leaps." Obviously, John BROWNE did well for himself. He became an M.P. for the Borough of Castlebar in 1743, was created Baron MONTEAGLE in 1760, Viscount Westport in 1768, and Earl of Altamount in 1771. By mid-century he decided on the ambitious project of building a new town on his estate, and he continued with this project his death in 1776 when it was continued by his son, Peter Browne, the 2nd Earl. Even now, Westport House in County Mayo is one of the showplaces of Ireland. A massive Georgian mansion, it stands on the site of an ancient castle of the O Malleys (the dungeons can be visited). It commands a magnificent view over Clew Bay and the Atlantic Ocean to Achill and Clare Island and Ireland's holy mountain, Croagh Patrick. The original house was built by Colonel John Browne and his wife, ancestors of the present Marquess of Sligo. His wife was a great-great-granddaughter of Grace O Malley, the sea-faring pirate queen of Connacht in Elizabeth's time. The house has a fine collection of old silver and a library with many priceless books and manuscripts. There are portraits by Sir Joshua Reynolds of the Browne who was 1st Earl of Altamont, and of the Rt. Hon. Denis Browne, brother of the 1st Marquess and a member of Henry Grattan's Parliament. Beechy did the portrait of the 2nd Marquess, who spent four months in an English jail for bribing British seamen, in time of war, to bring his ship loaded with antiques from Greece - including the gates of Mycenae - back to the harbour at Westport. This same enterprising Marquess was a friend of George IV and the poet Byron. All his life Lord Altamont, Jeremy Browne, son of the present Marquess, has been fighting to retain this magnificent inheritance which is threatened by taxation and recession. He opens the house to the public and has established many attractions - an art gallery, boutiques, a zoo and camping sites. Thousands of people visit Westport House every year. Now, I said earlier, there was a clue in all this about our connection to this particular line of the BROWNE family, and it rests in the title given to John BROWNE way back in the 1700s, the title of Baron MONTEAGLE. My grandmother’s father had the middle name “MONTEAGLE” as did many of his sons. One of these sons, Edgar Monteagle BROWNE made much of this in his political career, always making sure that he was known not as “BROWNE” but as “MONTEAGLE-BROWNE”. Descendants of John BROWNE to follow. I have a lot to learn about hereditary titles and how they work. For example, Marquess of Sligo. PRONI records. Search done for BROWNE & MONTEAGLE. One search for MONTEAGLE turned up a Thomas Span PLUNKET, 2nd Baron PLUNKET. Given that my father’s middle name was “Plunkett” this too is tantalizing. Also, the BROWNEs of Janeway, Ardglass are likely worth looking at more closely – see the biography of John Monteagle Brown for details in a newspaper clipping.